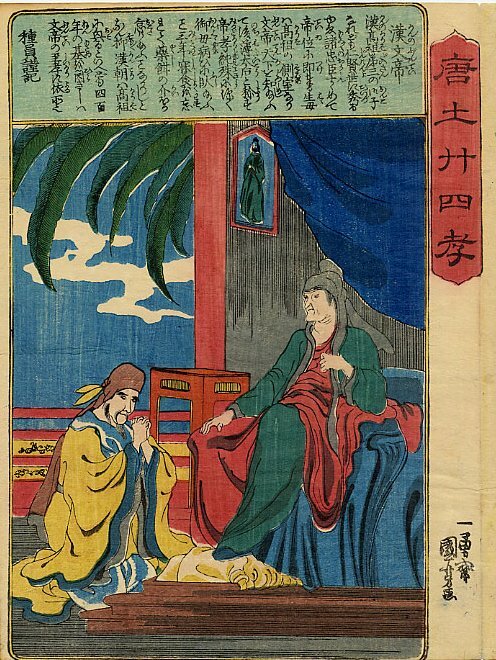 The book entitled The Twenty-four Paragons of Filial Piety was written by the Chinese scholar Guo Jujing during the Yuan Dynasty. His pen name was Yizi, and he is known in Japan as Kaku Kyokei. The book recounts the self-sacrificing behavior of twenty-four sons and daughters who go to extreme lengths to honor their parents, stepparents, grandparents, and in-laws. 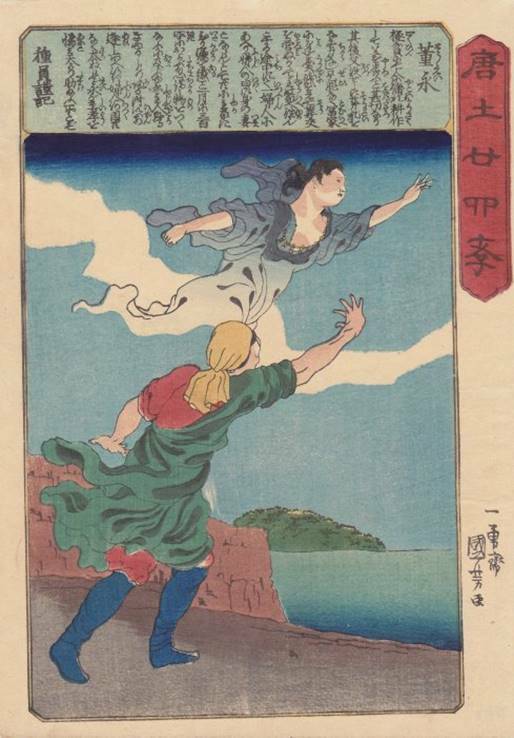 Many of the images in this series appear Western in style, rather than Japanese, and were probably copied from Italian prints. The prints in this series are each about 10 by 7 inches (25 by 18 centimeters), a size known as chûban. 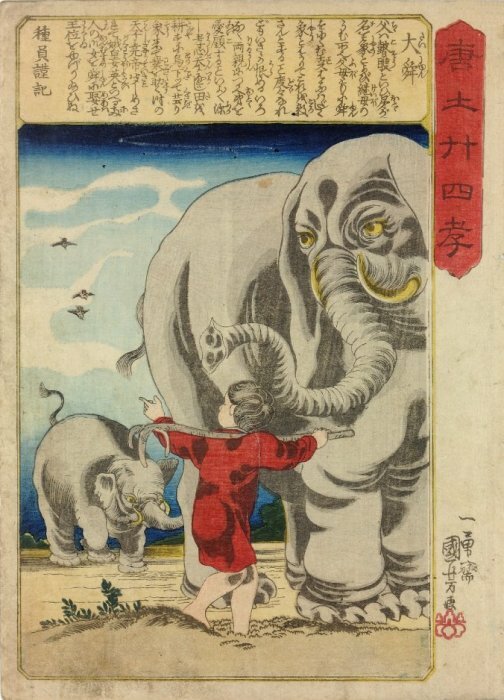 Legend: Despite a neglectful father who favored his cruel stepmother and her son, Taishun cultivated land for his parents on Mount Li, where an elephant and a bird helped him with the difficult task. According to legend, Taishun eventually became emperor of China. Legend: Môsô fulfilled his sick mother’s wish to eat bamboo shoots in mid-winter by journeying to a snow covered bamboo grove, where after praying, he miraculously found a huge cache of delicious bamboo shoots beneath the snow. 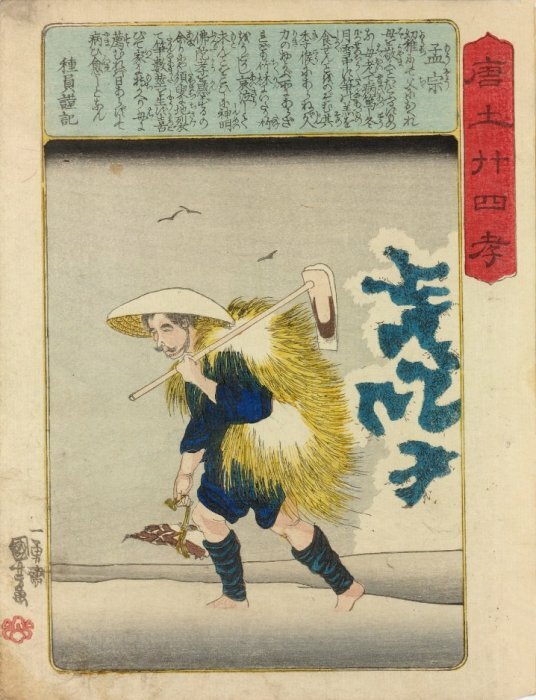 Here he is carrying a hoe and bamboo shoots through the snow. 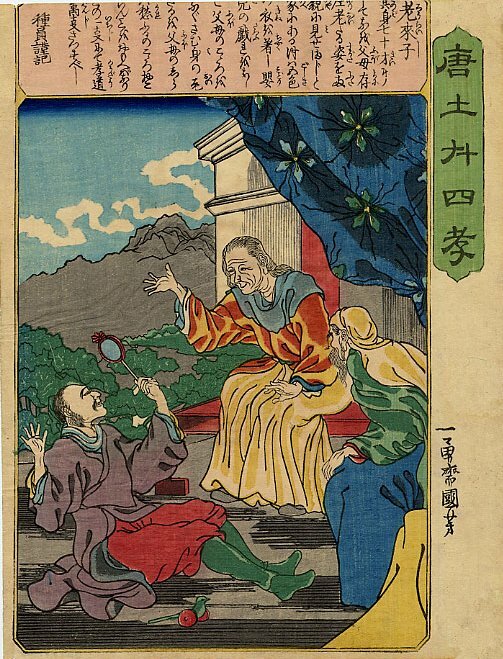 Legend: Kan no Buntei was the second emperor of the Han dynasty. He tasted his mother’s food to protect the queen dowager from poisoning. 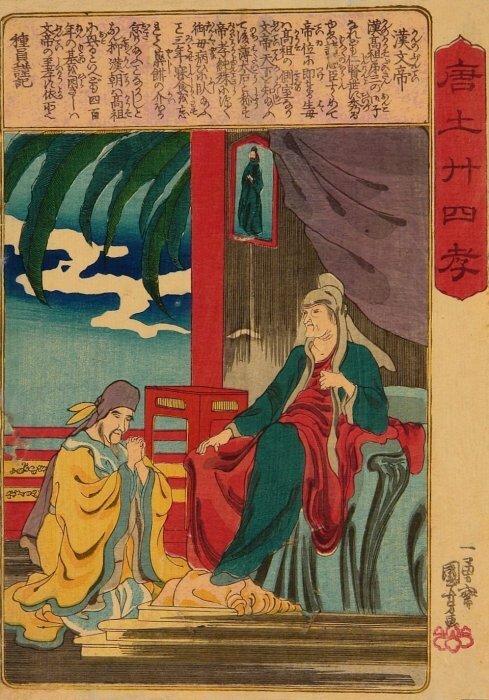 Here the emperor is kneeling before his mother. Legend: Teiran carved wooden images of his parents to which he regularly paid his respects. Returning home one day he found a frown on the face of the statue of his mother and learned that his wife had insulted his mother’s memory. He apologized to the wooden image and severely scolded his wife. Here he is being derided by his wife for prostrating himself before his parent’s statues. Another version of the above print. It is a less labor intensive printing than the above, which almost invariably means a later edition. 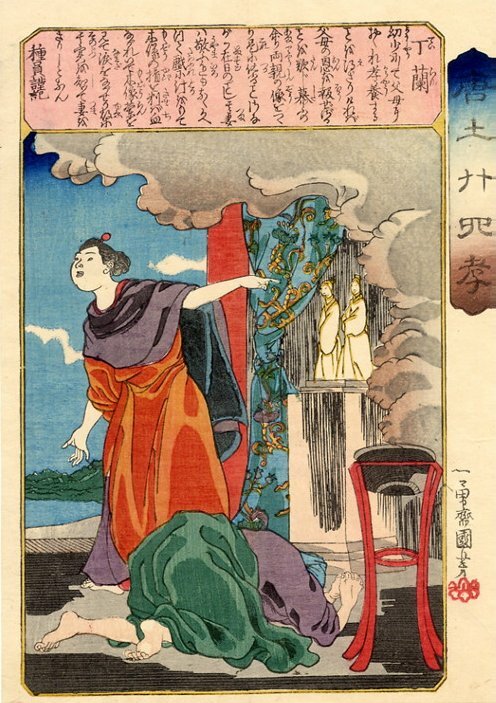 In this print, the delicate shading (bokashi) in the smoke, sky and title cartouche was omitted. Bokashi was achieved by hand-applying a gradation of ink to the wooden printing block rather than inking the block uniformly. This hand-application had to be repeated for each sheet of paper that was printed. 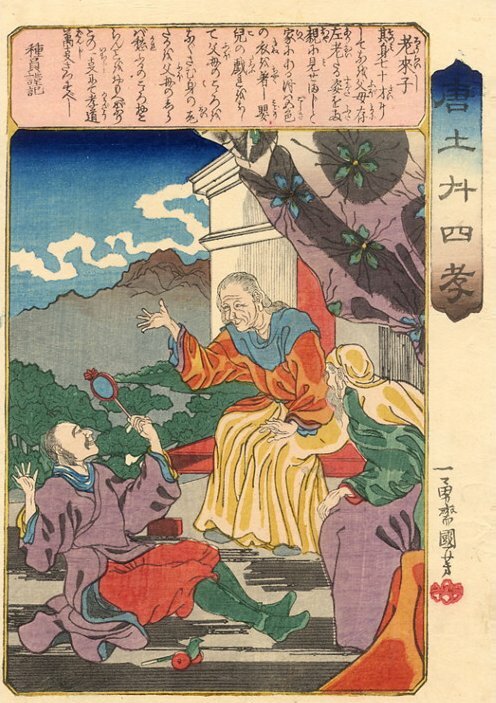 Legend: Binshiken entreated his father to have mercy on his new stepmother after his father found out that Binshiken was being mistreated. 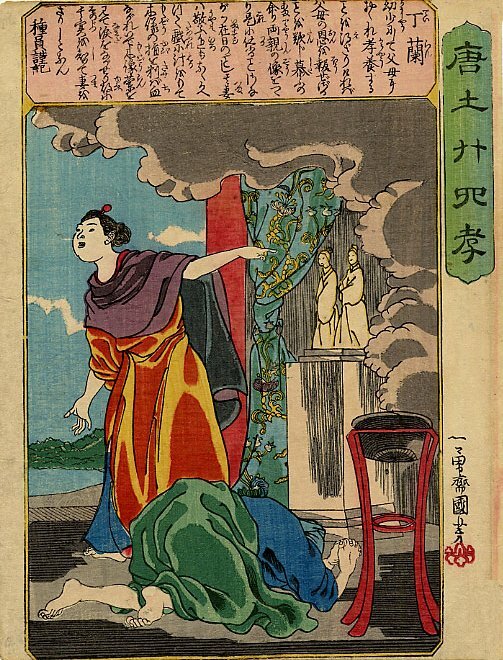 Here Binshiken is sweeping the floor for his reclining stepmother. 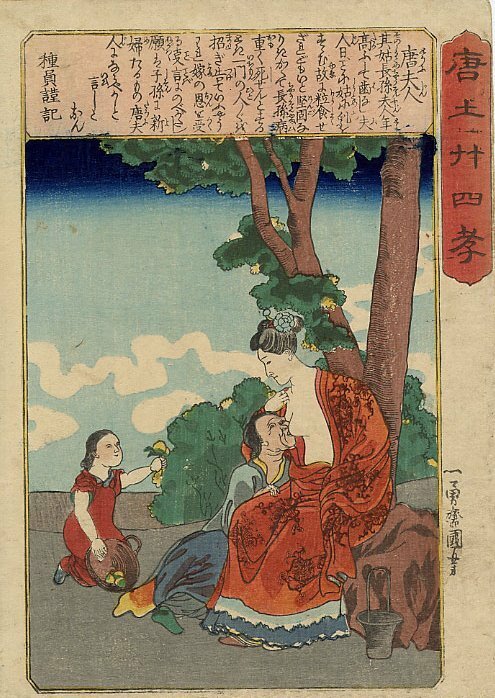 Legend: Sôshin was gathering wood in the forest one day when his mother back at home bit her own finger in anger at her son’s absence. Feeling his mother’s pain, he immediately returned home. Here he is suddenly sensing his mother’s distress. 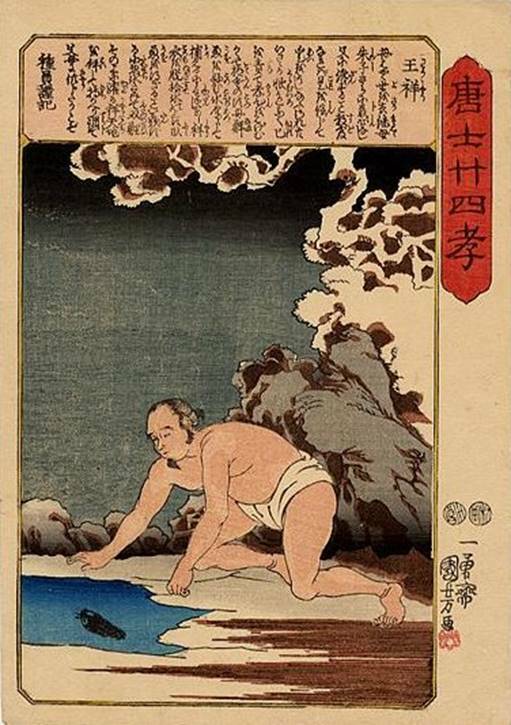 Legend: When his stepmother wanted to eat fresh fish in mid-winter, Ôshô went to a frozen pond and lay naked on the ice until it melted in order to catch fish for her. Legend: At age 70, Rôraishi still dressed and behaved like an infant to amuse his senile parents. 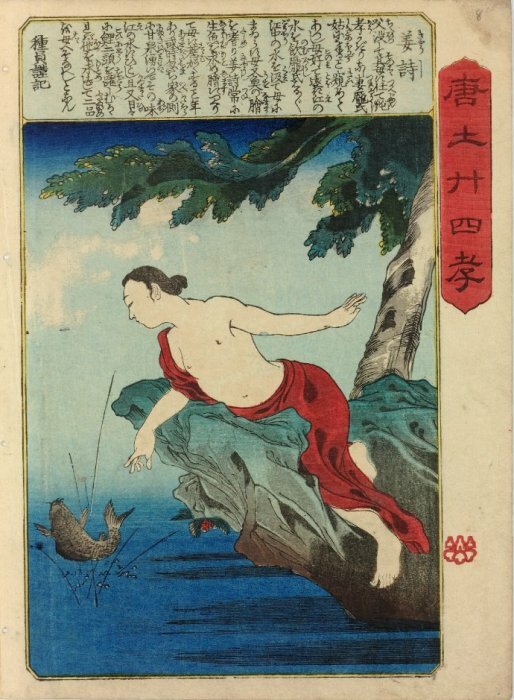 Legend: Kyôshi, along with his wife, traveled great distances to get good water and fresh carp desired by his aged mother. However, one day a fresh spring suddenly bubbled up in their own garden and provided excellent water as well as fish. 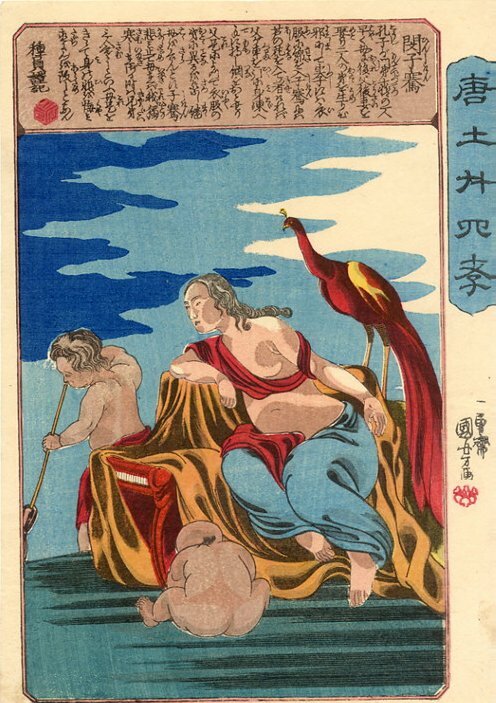 Legend: Tô-fujin (also known as wife Tang) suckled her toothless grandmother at her breasts. 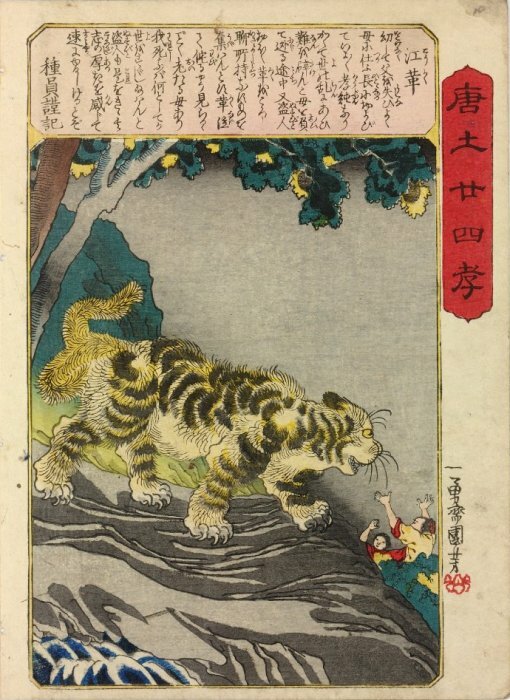 Legend: Yôkyô at 14 years of age was accompanying his father into the mountains when a hungry tiger leapt out at them. 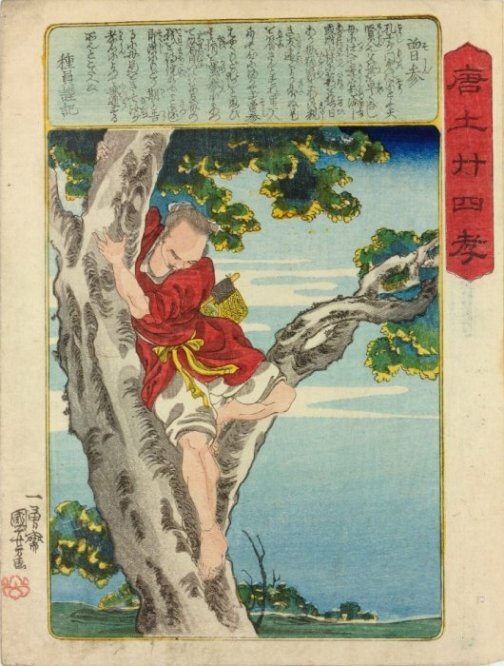 Without thinking of his own life, Yôkyô protectively jumped in front of his father and thus scared off the tiger with his show of determined will. Legend: Tôyei indentured himself to a weaver in order to raise money for his father’s burial. 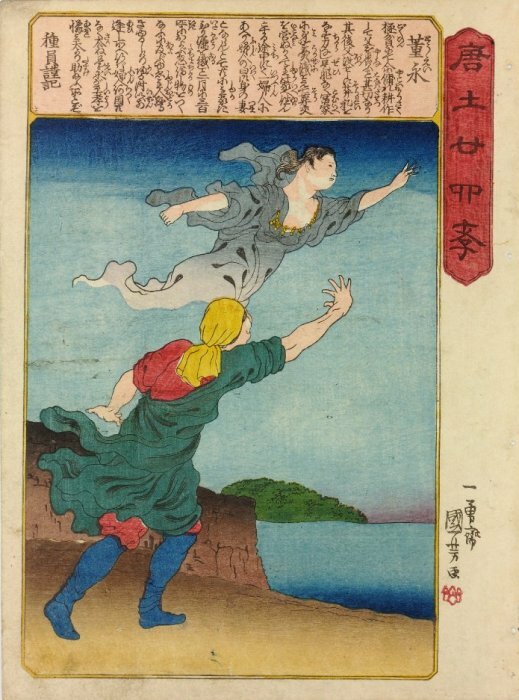 One day he met a woman who, in the first hour after their marriage, wove enough silk to fulfill the terms of his contract and then revealed herself to be the Heavenly Weaver (Shokujo) before ascending to heaven.